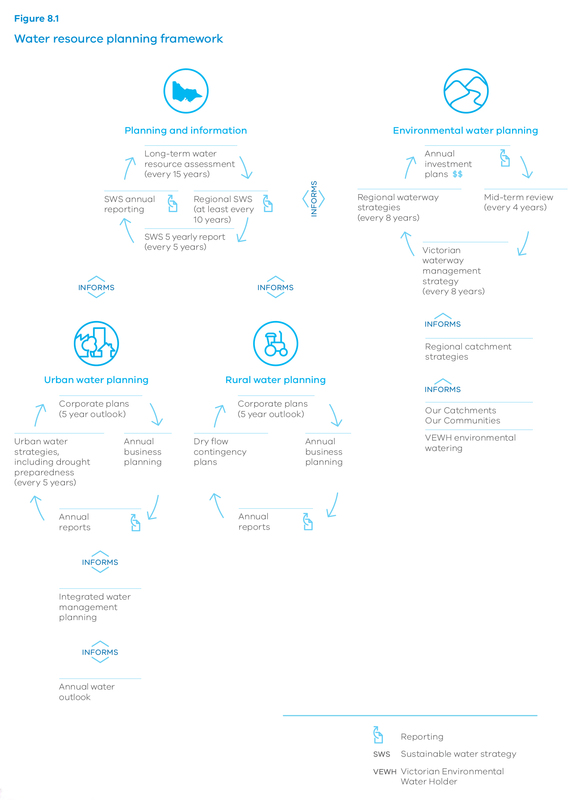 Planning and management of water entitlements is crucial to ensure effective, accurate delivery of water now and into the future. Secure rights to water and a responsive planning framework will enable us to adapt to the changing values and uses of water, as well as protect the environment. Water is critical for cities and towns, farm businesses and industry. Secure rights to water enable agricultural production and future industry growth. Improve water resource information to support planning and decisions. Our robust water entitlement and water resource planning frameworks provide certainty of legal rights and obligations, and flexibility for entitlement holders to manage their own risks and make decisions about how they use water to meet their needs. The strength of our water entitlement and planning frameworks was reinforced during the Millennium Drought. Together with the water market and water supply infrastructure, these entitlement and planning frameworks provide security and create confidence for communities, the environment, and business, industry and investment growth. We need to understand, manage within, and plan for changing water availability, and patterns of demand and use. We will find better ways to share information and data, including climate change scenarios, to improve how we plan and manage water.